This morning, after a breakfast of eggs, sausage, bacon, and potatoes, I told Tom that I definitely want something light for dinner tonight. Also my stomach had been a bit achy all morning and afternoon. Dinner time rolled around tonight, and Tom suggested Subway. Eh…I said. That doesn’t sound very good. Last time we ate there it wasn’t very good. I want something warm. (I crave warm foods, is that weird?). Well, Tom suggested, get your sub toasted. No, I said back, even if you toast it, it’s not very warm. And then I decided I was craving Middle Eastern food. So, we decided to try out a new place, Ali Baba’s near campus (Packard/Hill intersection). I seriously used to live ONE block from here for a year, and never ate here. Crazy. When we first walked in, I was a little taken aback by one of the workers laying in a booth, resting his eyes (he also sat slumped in the booth for the next 20 minutes, or so), but our server was very nice. Rather than go “light,” we pretty much went all out instead, and ordered the Sampler Plate. 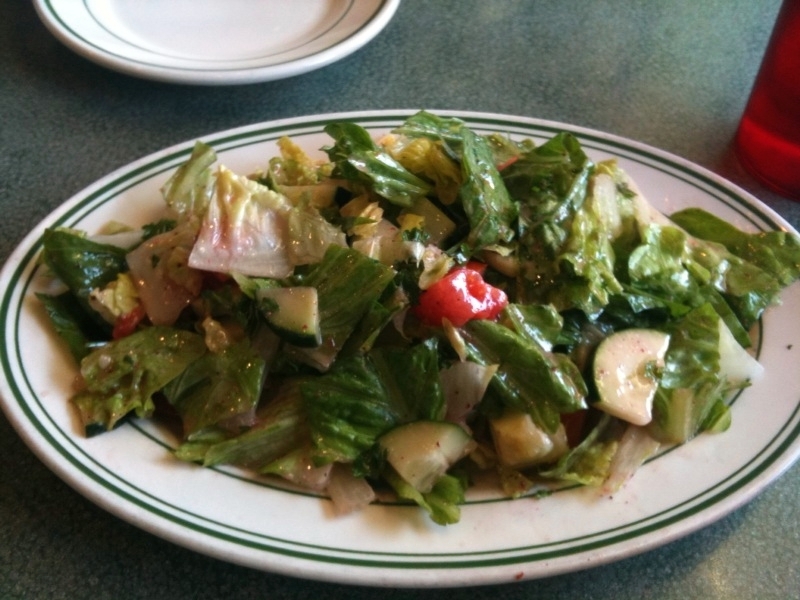 We started out with a large dish of salad, which we split, and was fantastic. This was all served over a heaping pile of rice, and served with pita bread. 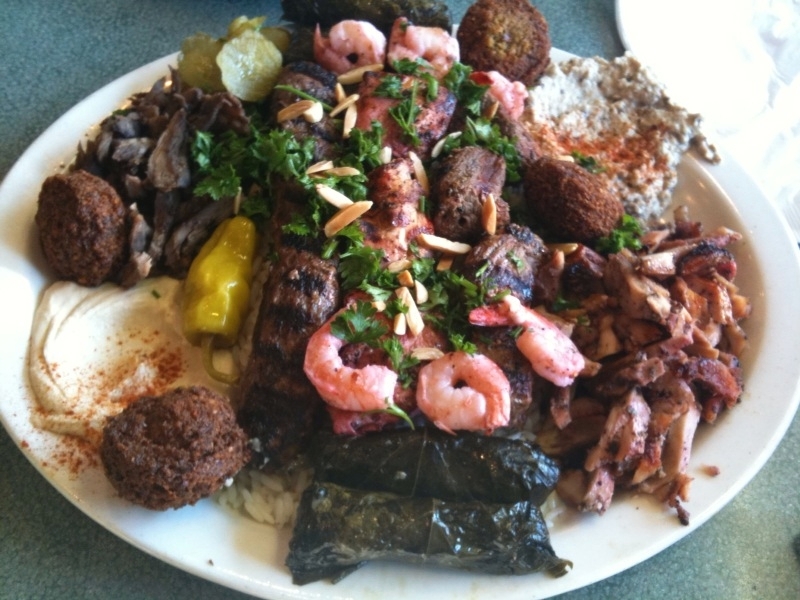 We often order a platter similar to this at Palm Palace, also in Ann Arbor, where it is a bit pricier. I have to say that this was absolutely just as good! Some parts of the meal were even better than some of the dishes at Palm Palace. OMG, I seriously love Middle Eastern food. It may be becoming my favorite type of ‘ethic’ food. After dinner, since we were on campus, and parked in our old neighborhood (near Fletcher Hall, for you Ann Arborites.. we used to have an apartment on Benjamin St, when I was a senior in college), we decided to go for a stroll around our “old stomping grounds.” We seriously used to go walk this certain path everyyyyy singleeee night, the summer of (thinking…)… 2008! (From Benjamin Street, to Mary, to Hoover, to State, over to White St, and down to the Kroger on S. Industrial, and back), so we decided to do it tonight, since it was such a lovely, sunny evening. The city is so alive right now, downtown and on campus – all the students are back in town, which means parking gets more difficult and general congestion around town is increased, but really it doesn’t bother me – I like the energy and excitement around town. I am so beyond thrilled that I have tomorrow off work. I have nothing planned, other than grocery shopping and cleaning house, and I love it! A day of nothing sounds fantastic! Pingback: Photolicious Shopping Spree « Meg.Goes.Nom.Nom.